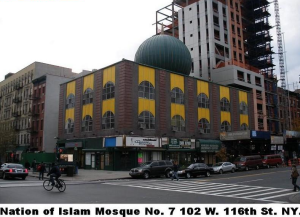 On April 14, 1972, at 1142 hours, a call for “officer in distress” came in from a person claiming to be “Detective Thomas” at the Muhammed Mosque #7 102 West 116th Street New York. Responding police officers were pushed out of the mosque by muslim men and the doors were locked. Two officers remained trapped inside on the ground level and were attacked by over 16 men who overpowered them, forced them to the ground and took their weapons. Officer Phillip Cardillo was shot one time and mortally wounded.. The other officer was knocked unconscious, and his weapons were never found. As other police officer tried to make entry into the locked mosque, they looked thru the window and saw both officers laying prone while two large groups of muslim men beat and kicked the officers. The mosque doors, usually bolted shut and manned by muslims at the mosque were unlocked and unguarded until responding police officers were inside, at which time they were locked. Reports from officers stated “the situation in the street deteriorated … to the point of potential riot” because officers were inside the mosque. During the investigation immediately after the shooting/attack, mosque leader Louis Farrakhan and U.S. Congressman Charlie Rangel worked a deal with the NYPD commanding officers. Police agreed to leave the mosque, leaving behind the crime scene, blood and ballistics evidence, and 16 suspects while Farrakhan and Rangel promised to deliver the suspects to a local police station that afternoon. Suspects were not delivered and the murder weapon was never found. Lewis Dupree was eventually arrested for Officer Cardillo’s murder. However, the lack of evidence hindered the prosecution. Dupree’s first trial resulted in a hung jury. In a second trial, Dupree, who now uses the name Khalid Elamin Ali, was acquitted. The lead prosecutor in both trial never saw the Blue Book which contained leads, witness names and ballistics reports. The mayor and police commissioner did not attend Officer Phil Cardillo’s funeral. 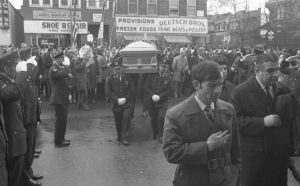 This was a sad day when a cop killed in the line of duty protecting New York city did not have the support of his commanding officers. Why did someone from the mosque ambush a police officer? Who lured police to the second floor of the mosque? Who ordered the guards off the doors of the mosque and left them unlocked and unguarded? Was it someone with knowledge of police procedure? Did the upper ranks of the New York Police Department, FBI, a US representative and members of the Islamic community work together to impede the murder investigation of a NYPD police officer? Why were detectives on the initial investigation not aware of the Blue Book? Why did NYPD conduct a parallel investigation? Over 40 years later, some things remain the same. Members of Congress are still protecting criminals and jihadis in our communities, and some even advocate for the jihadis. Police are not allowed to be aggressive and harsh in their pursuit of jihadis which emboldens and encourages the jihadis to fight harder as the years go on – per sharia law. The failure of local, state, and federal leaders to understand the threat and aggressively go after that threat cost lives. It cost lives of our military in Afghanistan and Iraq, and it did in New York in April of 1972. Mr. Guandolo, the protection is still going on. I received a letter from Xavier Becerra NOW California Attorney General, PREVIOUS Member of Congress House of Representatives, 34th District, California (Where by the way, I LIVE) saying that the Real victims of 911 were Muslims and that now there is a Bill, (H.Res. 413) created and passed by Representative Eddie Bernice Johnson for the protection of Muslims. So now every time Muslims do Terrorism they are considered the victims. They should actually be considered ENEMY COMBATANTS and Becerra and Johnson should be charged with AIDING AND ABATING ENEMY COMBATANTS. This Is Congress Protecting Terrorists. I Still Have The Letter If You Want A Copy. So idiotic of the Western world to let the enemy invade its nations. Incredibly idiotic and weak and pathetic. A total failure of leadership. Myriam, thank you for informing us of this horrendous bill. (replication of Oct. 6, 2016 Guandolo’s Throwback Thursday, 7 years ago, Sec. of State, H. Clinton, assists 57 Islamic UN nations passing U. N. Res. 16/18 Sharia law superceedes U. S. Fed Code in U. N. Both part of the U. N. Agenda 21 (for the 21st century). Will you contact the local talk show hosts to cover it to ask others to put so much pressure against this; all are in danger of such a law & the county Republican Party asking them to take action to expose this & call , possibly petition, rally, etc & put so much exposure and pressure against this & get it covered on national tv & conservative talk radio hosts. I am Denver & will contact local radio shows for coverage to get their hosts to press the tv stations to cover this & link it to John’s article here. The Council on Foreign Relations (1921) &Trilateral Commission (1976) as described in James Perloff’s, TRUTH IS A LONELY WARRIOR; Dr. Stan Monteith’s THE BROTHERHOOD OF DARKNESS & so many others expose the international communist/Islamic/papacy/Chamber Commerce + associates. Unless we organize to stop this, we will face unimaginable consequences. Amon, Jordan, government center,includes a mosque, the Catholic Church,& MASONIC TEMPLE. Since six corporations own 95% of all U.S. media (tv,print,radio,internet) so talk shows are vital to give out the legislators phone numbers to contact to stop such blasphemy.. Jeremiah 29:7 & 8 “ACT on behalf of the welfare of your nation, for your welfare is directly related to your nation’s welfare. Don’t let your leaders be liars.” We can post here to update each other; I don’t FB or T. THANK YOU JOHN honoring Phillip Cardillo & exposing the filthy truth. As goes Calif so it effects legislation in other states; http://www.cpusa.org shows they will stop at nothing in the Nov 2018 elections. I am getting others to contact the W H, Mark Meadows (Freedom Caucus) to stop this linking visas for DACA; ENFORCE MEXICAN IMMIGRATIONS LAWS OR OUR CURRENT LAWS ON THE BOOKS…they go back to the families they deserted. We are not extending the unconstitutional executive order made by the previous man in the White House, they go to the end of the line for legal immigration; U.S.A. allows more legal immigrants annually than 190 total other countries do combined. The gumball video at http://www.numbersusa.org proves its 12 more times expensive for American taxpayers, makes no dent in world poverty & overwhelms planned from U. N. Agenda 21 (now called Sustainability 2030 , 2050) to take over America. Given the fact that the City of New York Police Department (NYPD) comprises a relatively massive array of diversified law-enforcement entities, and apparently eschews any hint of conceptual consolidation which apparently necessitates perforce the fielding of more designated “Chiefs” than do the Sioux, Mohawk and Navajo American Indian tribes combined, one wonders how said storied organization has avoided the inevitable top-heavy afflictions of nepotism and political influence, or has it? E.g., the deliverance of Police officer Phillip Cardillo (RIP) from the nefarious grip and inevitable affect of political misfeasance, betrayal and death was effectively precluded when one or more senior on-site officials of the NYPD not only chose to ignore the obvious fact that said Manhattan mosque where he was murdered was from the outset of the initial radio-run a potentially lethal crime scene possibly involving the taking of hostages, but, nevertheless, also chose not to order the deployment of the city’s Emergency Service Unit’s SWAT team and mobile-ramming equipment to force entry into what predictably became a criminal haven, to, thus, at least attempt to achieve possible rescues, ostensibly, as details of the cowardly “deal” confirmed, to avoid offending the tender sensitivities of sharia-adherent killers. Blue Book?, try shameful cover-up in behalf of Islam, with whom the U.S. is currently engaged in a literal war* of survival. *Verbatim copies of the Arabic-to-English translation of Islam’s declaration of war on the United States, which was seized by Special Agents of the FBI from a subterranean basement in Annandale, Virginia in compliance with a federal search warrant in 2004, may be had (for a nominal handling & postage fee) by contacting http://www.securefreedom.org to request: GOVERNMENT EXHIBIT 003-0085 3:04-CR-240-G U.S. v. HLF, et al. This is the most shocking expose I’ve read in a long while. How much longer can the USA survive when so many of our leaders are such scoundrels? Not much longer. Americans, stand up.